I’ve worn these pyjama bottoms a lot. What I like about this pattern is the width of the leg, particularly around the thighs, because there is plenty of room there! 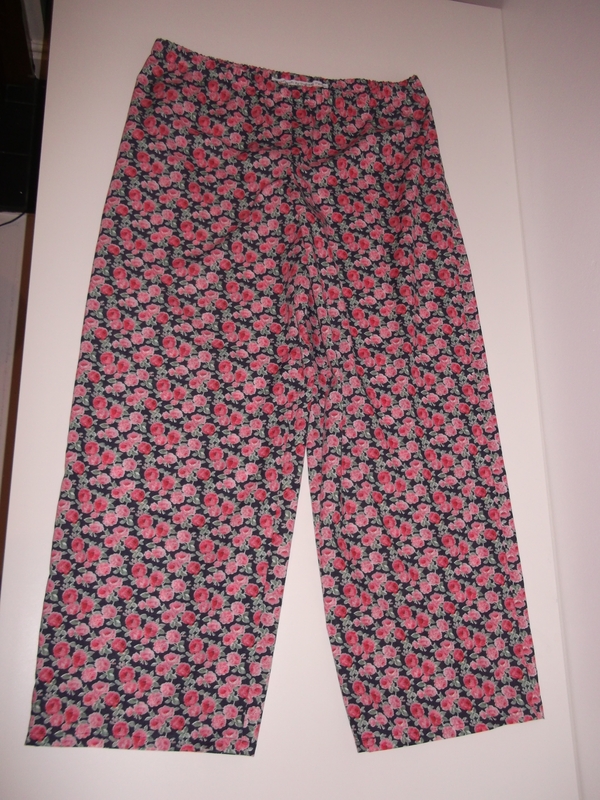 However, since making the pyjamas shown above I confess to buying three other pairs from shops. The first pair from Primark cost £5 and were stupid – too big on the waist and then tapered down towards the bottom – and then shrunk in the wash anyway. I then decided that I must buy better quality (read: more expensive) pyjamas, and splashed out on two new pairs from Next. I made sure to try these ones on, and I was happy with the fit, the length, the width etc. But with repeated wash and wear they just haven’t stayed the same. They are shorter and tighter – and that’s not just down to pregnancy weight gain – it’s because they are officially stupid. 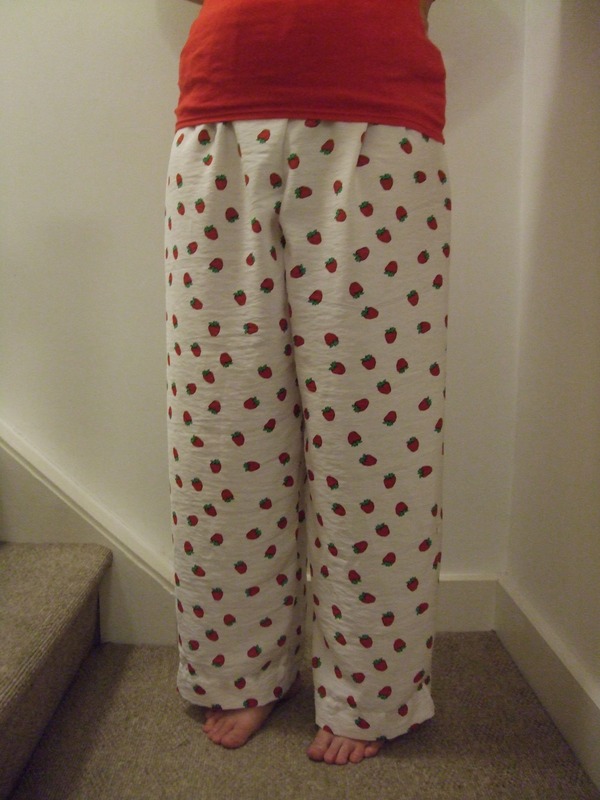 I kept returning to the strawberry pyjama bottoms (which are starting to wear out a bit now), especially the more pregnant I got, and decided to give up searching for the perfect shop-bought pair and just make them myself. I used up some Amy Butler fabric I’d had in my stash for about three years, and whipped these up in under two hours. I took 2.5″ off the waistband to make them sit a little lower, and 1.5″ off the hem. 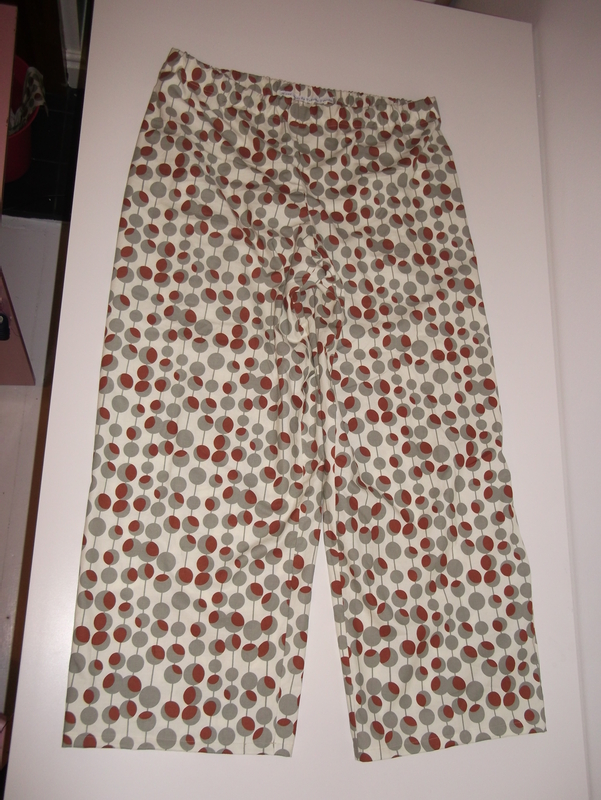 This meant I could do a 5/8″ hem and the trousers would be the perfect length for me, but the main advantage of these alterations is that I could squeeze a pair of pyjama bottoms out of a 2.2m length of 1.15m wide fabric, with only about 1cm waste!!! 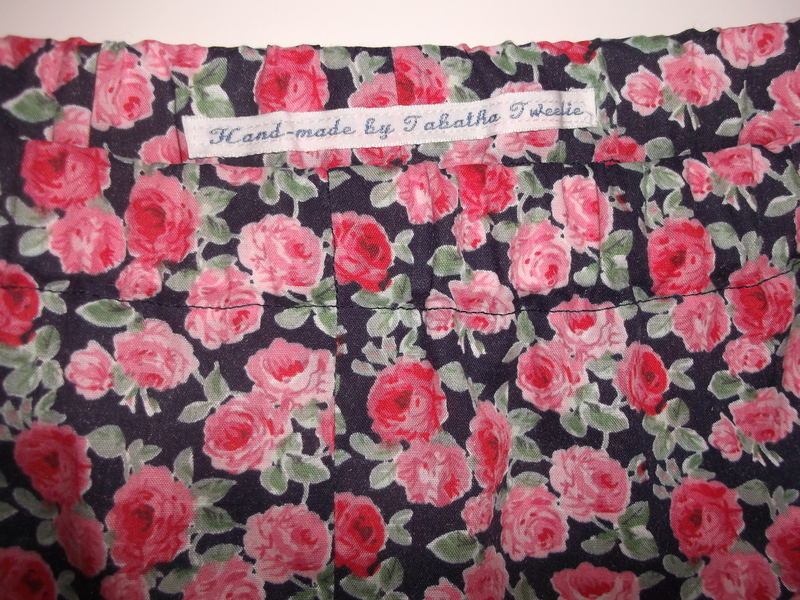 As soon as had I made these I wanted another pair, and I had another 2.2m length of fabric in my stash that needed using up – the leftover cotton I used to line my Truffle dress. So during one of Little Tweedie’s naptimes I made myself a second pair. 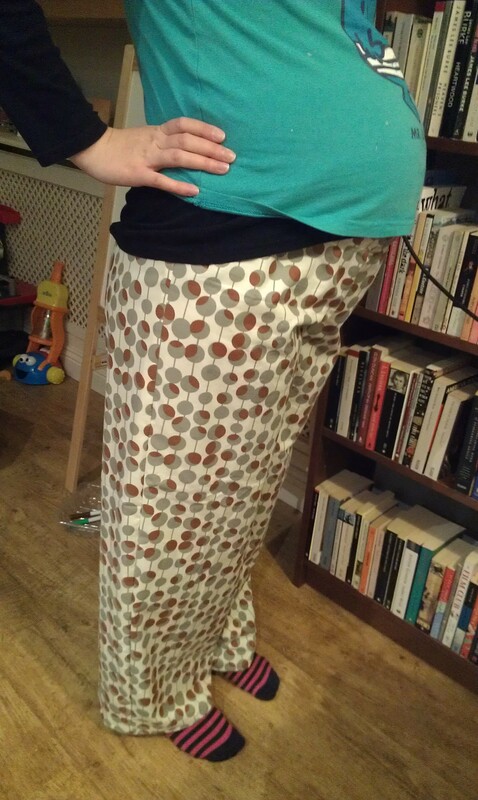 It only took an hour and a half to overlock the edges, sew them together, hem the trouser legs, sew in my ‘Handmade by Tabatha Tweedie’ label and make the waistband casing, and then I added the elastic into the casing later on in the day, which took about ten minutes. 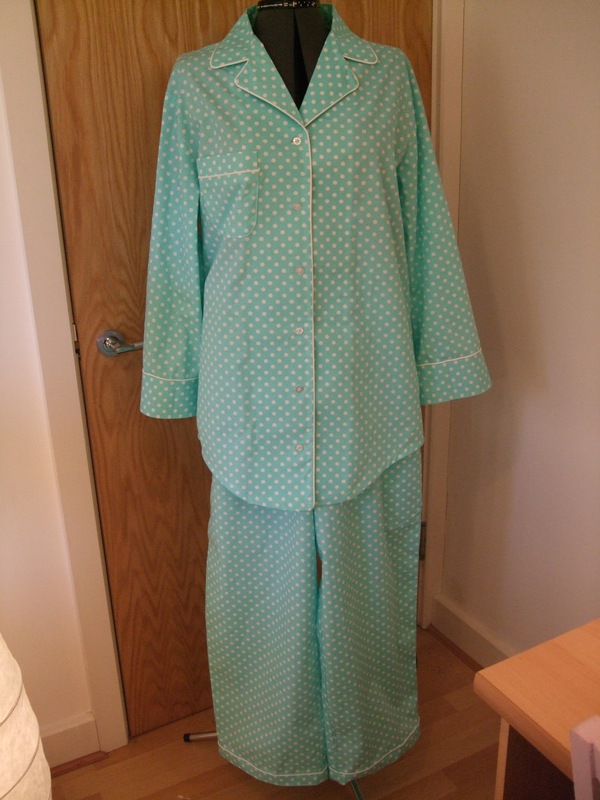 I’m super pleased with both pairs, and I can almost guarantee I am never going to buy RTW pyjamas ever again. The fit of these is just exactly how I like, and I know they will keep their shape and last a good few years, even with constant use. I could prettify them a bit more – add pockets, ribbon trim etc, if I wanted to, and of course I could also make a matching top like I did for my mother-in-law, but right now it’s all about ease and practicality! Hi Rebecca! The labels are from wovenlabelsuk.com I think – or somewhere very similar! 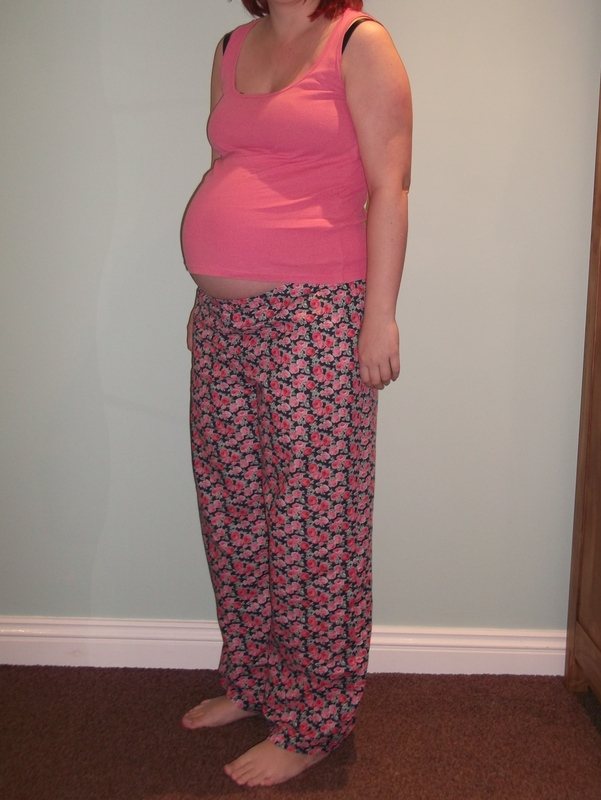 comfy jimjams are a must when you’re pregnant! yours are lovely. Yes indeed, plus they aren’t specifically maternity pjs so I can get tonnes more use out of them yet! Thank you. Ooh, I need a pair of pajama pants… Yours are lovely! These are both so cute! Maybe it’s time for me to make another pair! Yours were so cute too! They look fab… but made me lauch as I have a top in that Amy Butler fabric and also lined my nappy bag with the same fabric so it was just funny to see such a familiar fabric in a different context – does that make sense? Comfy maternity pyjamas are a must-have and yours look great. PS: That bump looks great…how much longer have you got? I remember you making that top, it’s lovely! I’m not sure how many weeks pregnant I was in that photo but I’m 37 weeks now & eagerly awaiting the new arrival!